The Ronnie James Dio Stand Up and Shout Cancer Fund, founded in memory of the voice of Rainbow, Black Sabbath and Dio, recently announced a weekend of celebratory activities to commemorate the 5th anniversary of the singer’s untimely death from gastric cancer on May 16, 2010. The events will take place from May 15-17, 2015 in Los Angeles, CA, and sponsors so far include: Monster Energy, Krispy Kreme Doughnuts, 100.3 FM The Sound, Ninkasi Brewing, and Western Bagels. Today, the organization is announcing more details regarding each specific date and their individual activities. As previously announced by Ronnie James Dio SUAS Cancer Fund Co-Founder/President Wendy Dio, the weekend will include a public Memorial Service, as well as a BOWL FOR RONNIE Celebrity Bowling tournament and the inaugural RIDE FOR RONNIE motorcycle ride and BBQ. See below for an updated listing of activities, ticket prices, and other information. 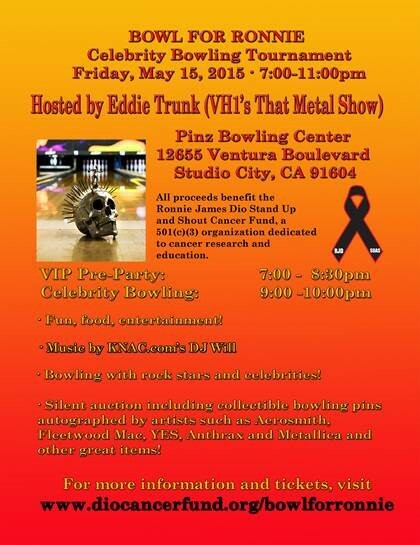 Hosted by Eddie Trunk of VH1’s That Metal Show, this will be an evening of fun, food, entertainment and, of course, bowling with rock stars and celebrities competing for trophies in the name of raising funds and awareness for the Ronnie James Dio SUAS Cancer Fund. A silent auction will include collectible bowling pins autographed by artists such as Aerosmith, Fleetwood Mac, YES, Anthrax and Metallica and in addition to many more major items. Music will be provided by KNAC.com’s DJ Will. Riders will check-in at Harley-Davidson of Glendale, where they can enjoy a continental breakfast with entertainment and prizes provided by The Sound 100.3. The first 200 registered riders will receive a limited edition RIDE FOR RONNIE Challenge Coin! Participants will depart Glendale, traveling the freeways of the north San Fernando Valley, then down the 405 to a BBQ at Los Encinos Historical Park in Encino. The BBQ will feature great food and drink, live music by Ronnie’s former bandmates and friends, raffle prizes, live auction and much more! BBQ-only tickets available to non-riders. BBQ included for registered riders & passengers. BBQ-only tickets for non-riders are available for advance purchase. Please note: event is subject to sell-out and tickets may not be available at the door. Avoid disappointment and purchase your tickets in advance! Check back at the Ronnie James Dio Stand Up and Shout Cancer Fund website www.diocancerfund.org for updates. A privately funded 501(c)(3) charity organization dedicated to cancer prevention, research and education, the Ronnie James Dio Stand Up and Shout Cancer Fund has already raised close to $1 million in its short history. Monies raised have been committed to the cancer research work of the T. J. Martell Foundation for Cancer, AIDS and Leukemia Research, the gastric cancer research unit of the M.D. Anderson Cancer Center in Houston, where Ronnie was treated for gastric cancer during the last six months of his life, and other cancer research projects.